Quite some time ago, I made a quilt. 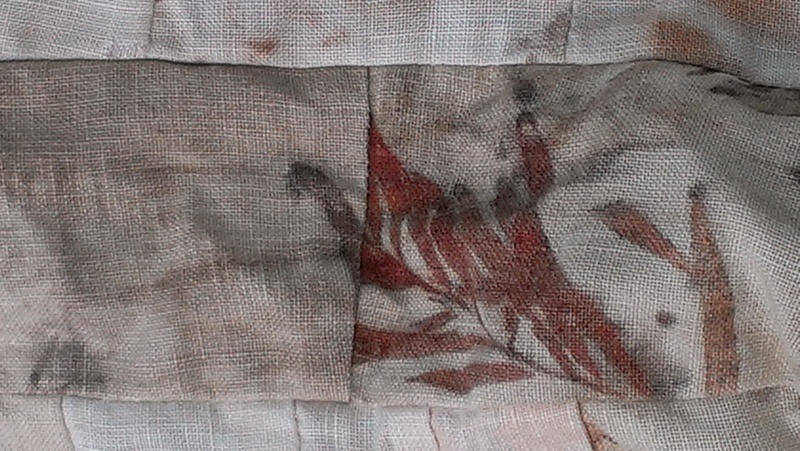 It was a project I decided on when I began to experiment with India Flint’s eco-printing technique on cotton and linen. Her book Eco-Colour (see the left hand sidebar of her blog if you’re following the link–her books are there) mostly focused on wool and silk, but offered some guidance about cotton and linen. I followed that guidance as best I could and at first I could achieve only pinkish smudges. 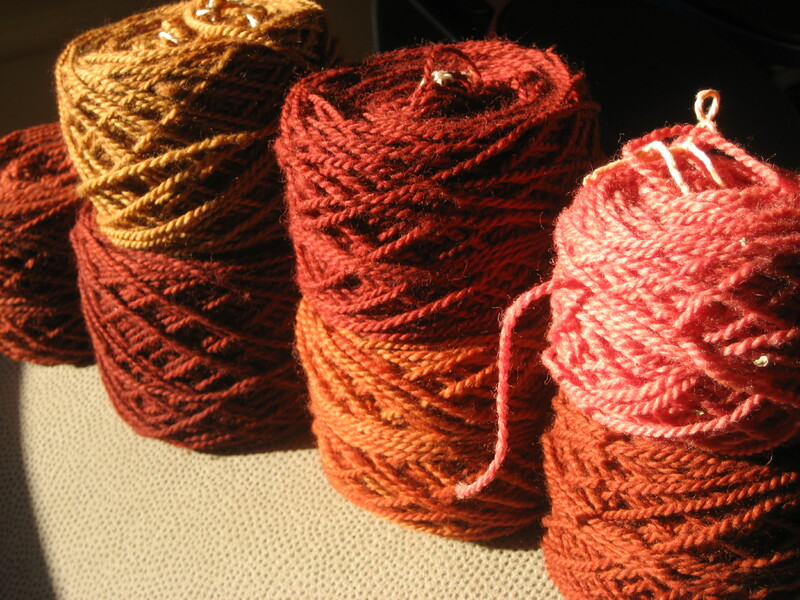 I had become pretty decent at dyeing wool by this stage, but only some of these skills proved transferable. 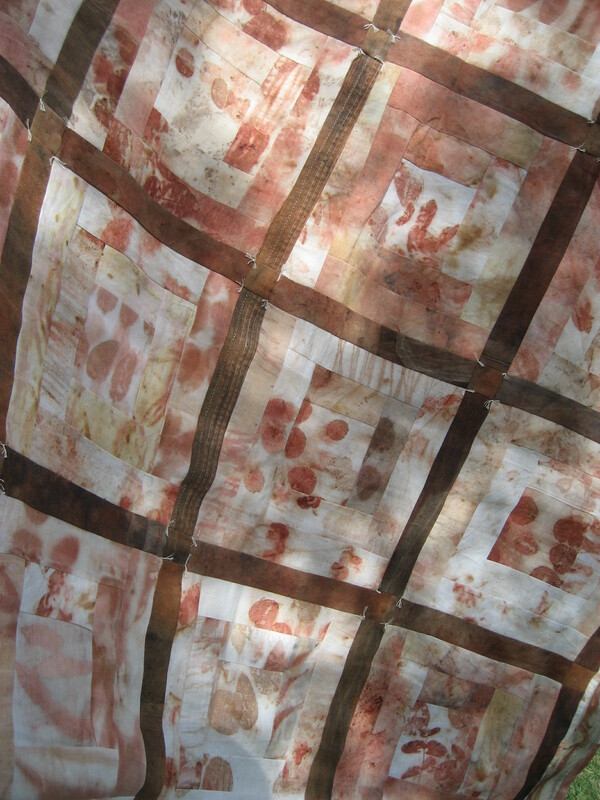 Leaf printing or eco-printing was clearly a whole other skill. I teach for a living and observe the process of learning almost daily both in those I teach and in myself. It is very rarely possible to read instructions and then successfully and immediately carry out a process someone else (that would be India Flint) has spent years figuring out and becoming exquisitely good at. Nor can the outcomes of a process with so many variables always be confidently predicted by a novice (that would be me). Indeed, just plain carrying out instructions accurately is not always possible on the first attempt. The amount of fabric wastage that might be involved in learning and practising made me think I would have to give up and just admire the work of others. India Flint, for instance. This was the point at which I thought of the quilt. If I made a log cabin style quilt, I could frame whatever leaf-ish smudges were my then best efforts, and the smudgy parts could simply be borders. Standards are not always high round here. 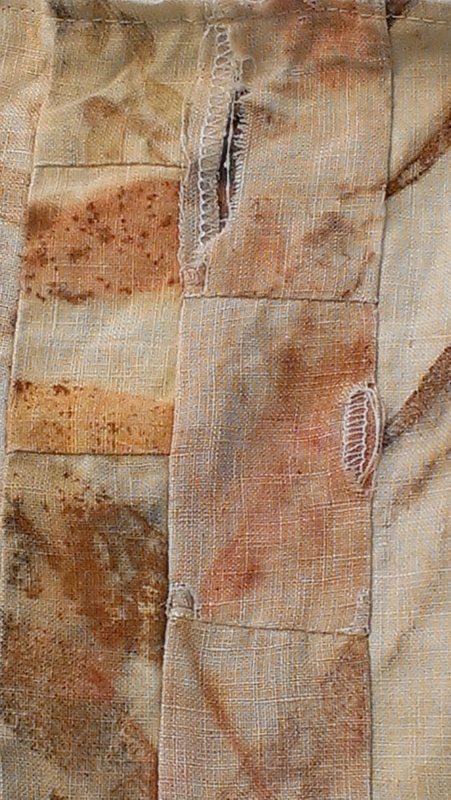 By the time I came to halfway through the back of the quilt, I had been experimenting for about a year and I had some breakthroughs–in understanding the process, in refining my skills at using it, in mordanting, in identifying eucalypts, even growing a few. 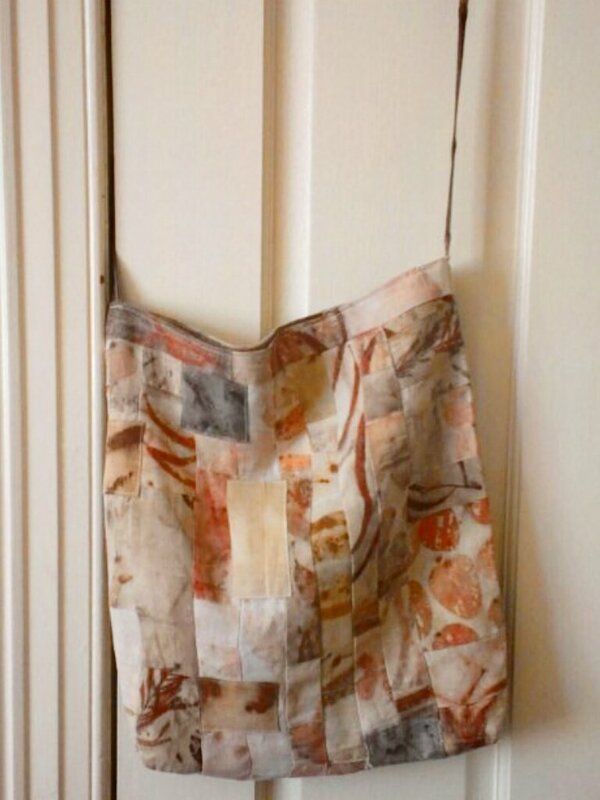 I made this entire quilt from recyled/upcycled linen garments from op shops and garage sales, most of them having gone there because they were stained beyond rescue. Needless to say, I couldn’t bear to waste a scrap. So even the tiny leftovers of the log cabin quilt were turned into other things. Including bags–which won’t surprise regular readers! There are also some points of real wear. I often think that a well made, long lasting garment or bag is highly desirable. But a thing that will stand the test of time is only a good thing when the item remains one you (or someone else) want to keep using. I own things that I wish would reach the end of their useful lives because I’m tired of them even though they don’t need replacement, or because a better version exists 20 years later. I have things I wish I had never acquired or that don’t have the capacity to biodegrade. I now think about the benefits of things that can break down and won’t last forever to burden coming generations. 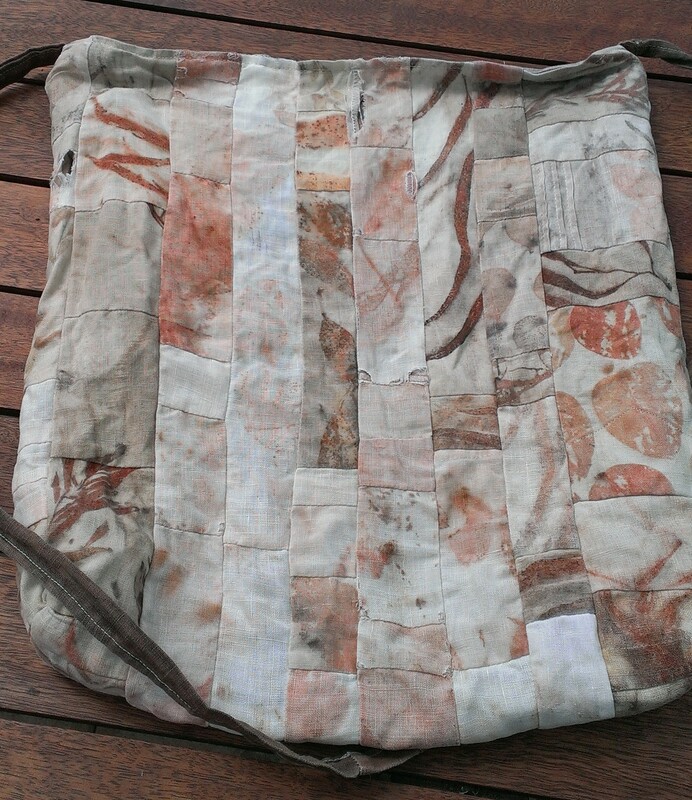 This bag, though, has had a short life as a bag because of the hard life some parts of it had as clothing, and it certainly will biodegrade. I polled some of my near and dear and they thought the bag should continue even if it required lots and lots of mends… So here it is, reworked considerably. Ready for more years of hard use, I hope! For those who are wondering, the quilt is doing fine so far and I remain happy to use it. Love it. I only got a lot of brownish sheets when I tried. Brownish sheets… that does sound discouraging! Would you ever try again? There is a mordant process in the how to section of this blog if you want to try again. It works for me–but I can’t say I never get disappointing surprises. I am imagining you have access to a completely different set of leaves than I can obtain, and it is certainly the case that the European trees I have tried tend to give browns–but these can be glorious, as Lotta Helleberg‘s eco-prints show. I may try again in the future – but I decided that I was spreading myself too thin and I don’t even sew much, so it was more of a fascination than a useful ting. But yes, splotchy or solid brown with hardly any prints at all. But I did learn a few things not to do. And perhaps I’ll give cotton a miss and try silk? I’m going to work with paper again at some point, if I can make that work, fabric may or may not come into play. I must say, the eucalyptys prints you guys are getting makes me envious every time. You do have to decide which of the exciting possibilities of craft you have time and passion enough to manage, I agree. And yes, silk (or even better, wool) will be easier as a starting fibre if you decide to go there again. Eucalypts… I can only say that I love them and feel privileged to be surrounded by them. I did travel to Denmark and Norway once, and just loved it. To be in a forest of birch, where birch belong, was just amazing. Thanks, Wendi! I really enjoy your blog and belatedly realised it wasn’t on my blogroll. Thanks for the compliment–I don’t think I’m much of a quilter–I like the patchworking part much more than the quilting itself. the work is absolutely gorgeous. this is great! I love your process and your connection to the bag and its life with you. 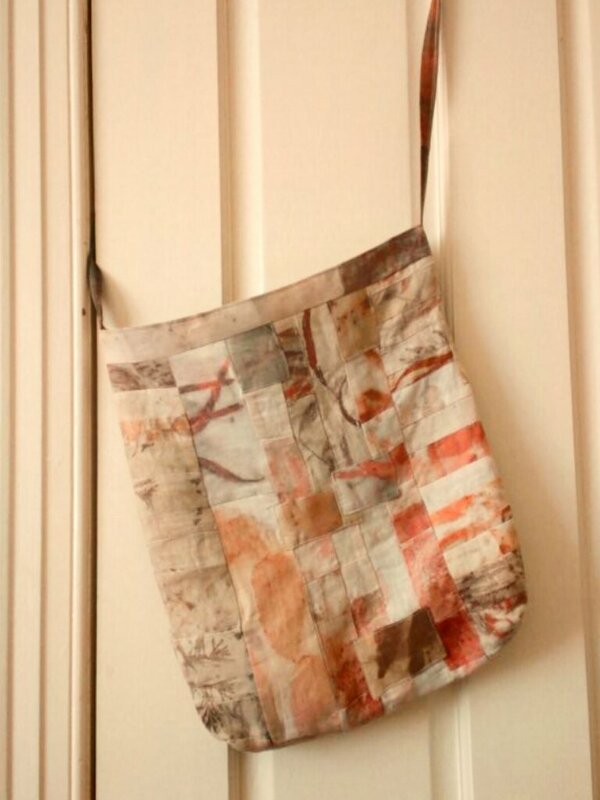 Your quilt and bag are just beautiful! 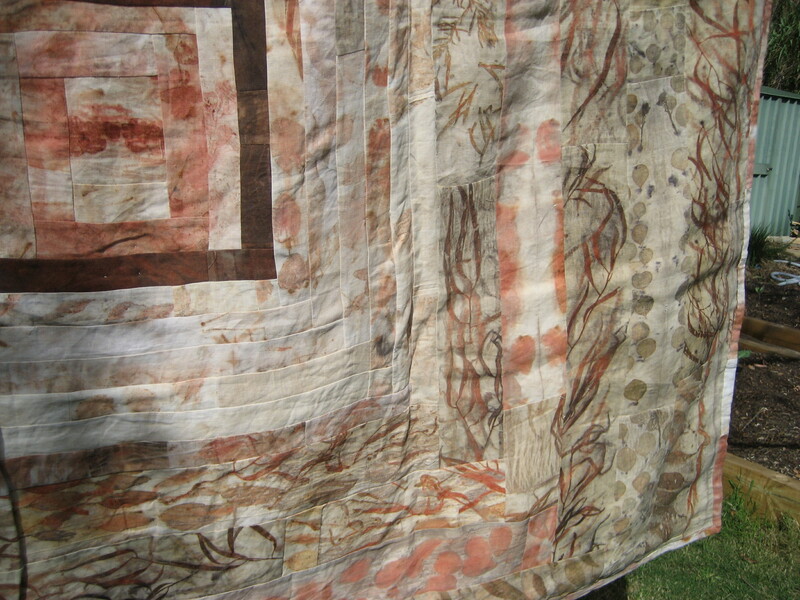 I especially like the quilt design, as it shows off the fabric so well. beauty, both of them as well as the concept behind. 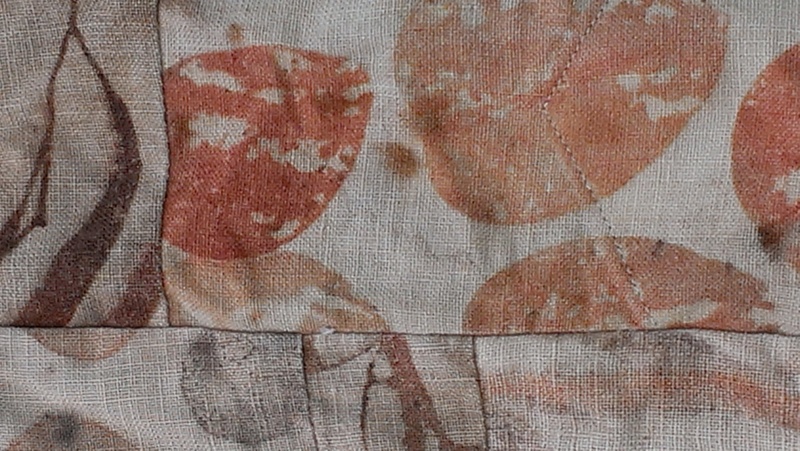 it’s a shame that cotton which is much easier to get hold of as a reuse fabric, is so hard to dye. going to check out your mordanting process … but the bag and the quilt are exquisite, beautiful things. a lot of love and patience went into those. Thanks so much! I agree with you about dyeing cotton, which I mostly wear and use. But I think I’ve made some headway!